The 2019 Application process for the ChicagoCHEC Research Fellows program is now open! The ChicagoCHEC Research Fellows program is a comprehensive learning experience for undergraduate and postbaccalaureate students at Northeastern Illinois University, University of Illinois at Chicago, Northwestern University, the City Colleges of Chicago, and other Community/ Junior Colleges in the Chicago metropolitan area who are planning to apply to graduate or medical school. This program is focused on the development of academic, technical, and professional skills in preparation for careers in social, behavioral, and biomedical research and in healthcare. ChicagoCHEC Research Fellows will spend the summer in seminars and research rotations learning from leading researchers. Following the summer intensive program, ChicagoCHEC Research Fellows will have the option to be matched with a research mentor and research project (depending on mentor and project availability) during the academic year. The Chicago Cancer Health Equity Collaborative (ChicagoCHEC) is a National Cancer Institute comprehensive cancer partnership led by the Robert H. Lurie Comprehensive Cancer Center of Northwestern University, Northeastern Illinois University, and the University of Illinois at Chicago. Our mission is to advance cancer health equity through meaningful scientific discovery, education, training, and community engagement. We believe that everyone should have the opportunity to attain their highest level of health. The ChicagoCHEC Research Fellows program, which seeks to increase the number of strong and diverse social, behavioral, and biomedical researchers and healthcare professionals, is critical to that vision. We are pleased to announce the 2019 ChicagoCHEC Fellows Program. 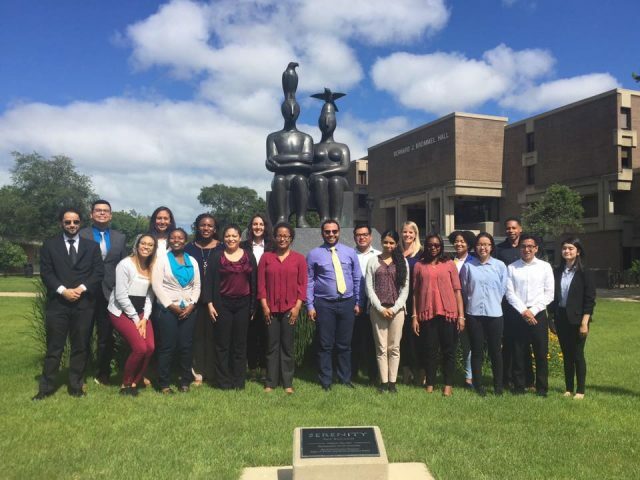 This program seeks outstanding undergraduate and postbaccalaureate students with an interest in health and health care who: (1) possess the commitment to apply to graduate or medical school; and (2) can bring diverse perspectives and experiences to advance the nation’s work toward cancer health equity. The ChicagoCHEC Research Fellows program consists of a paid full-time summer research and enrichment experience in Chicago. Afterwards, students will have the option to be placed in a research team during the academic year for course credit (e.g., independent study) or service learning credit. Research team placement is not guaranteed and dependent on project availability. All Research Fellows will have access to ongoing career advancement activities and must participate in periodic performance monitoring of career progression. All Research Fellows selected for the program must participate in the summer intensive experience from June to August 2019. The summer intensive experience is full-time; Research Fellows are expected to devote a minimum of 40 hours per week on a 9 AM to 5 PM basis to their research rotations and training. Students should not, therefore, expect to take courses or engage in other work or volunteer commitments during the daytime. The summer intensive experience prepares individuals for careers in social, behavioral, and biomedical research and in healthcare. During the intensive 8 week program, fellows will meet with leading scholars in basic, clinical, translational, prevention, control, behavioral, and population research over a course of research rotations at Northwestern University, the Robert H. Lurie Comprehensive Cancer Center, the University of Illinois at Chicago, and the University of Illinois Cancer Center, and Northeastern Illinois University. In addition, fellows will participate in journal clubs, case studies, near peer mentoring workshop design and facilitation with high school students, and group activities to develop communication, career readiness, writing, and critical thinking skills, as well as leadership development focused on self-reflection, building resiliency, understanding conflict, and finding mentors. At the end of the summer, fellows are expected to present at a symposium organized by ChicagoCHEC. This summer intensive experience is designed to prepare fellows for immediate success in their academic year research team placement. ChicagoCHEC Research Fellowship assignments are supplemented throughout the year by seminars and group discussions on a variety of research topics, as well as professional development and leadership training. During the 8 week long summer intensive program, ChicagoCHEC Research Fellows will receive a stipend of $3600 (students must be a U.S. citizen or permanent resident to receive funding). However, all students are welcome to apply. Students will complete a final project throughout the summer that will relate to the cancer disparity research of ChicagoCHEC research teams. Fellows can apply to receive course credit (e.g., via an independent study) or service learning credit. Housing, meals, and local travel support is not provided. Travel is required for the ChicagoCHEC Research Fellows program which will primarily take place in downtown Chicago. At the conclusion of the program, fellows become part of an alumni network and typically attend ChicagoCHEC’s annual meetings and become mentors to subsequent years’ ChicagoCHEC Research Fellows. Fellows are expected to meet ChicagoCHEC’s requirements for the submission of periodic information needed for overall project performance monitoring, which includes monitoring of a fellow’s career progression. 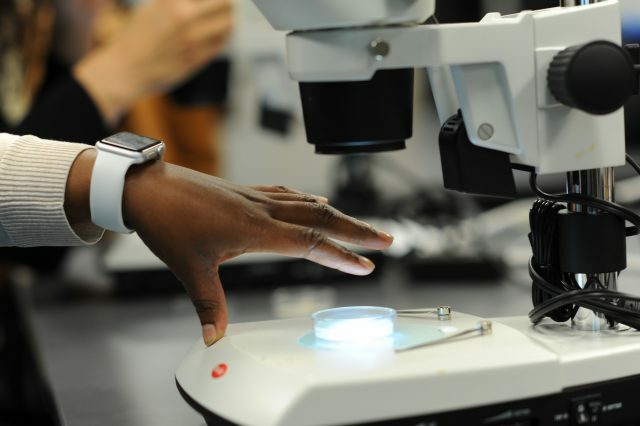 The ChicagoCHEC Research Fellowship is a research experience and enrichment program for undergraduate and postbaccalaureate students interested in learning more about the biological, environmental, social, and genetic causes of health disparities. Students with a keen interest in careers in social, behavioral, and biomedical research, as well as students interested in attending medical or other health professional school programs are especially encouraged to apply. The admission committee will give preference to students from diverse backgrounds, including underrepresented racial and ethnic groups (including but are not limited to African Americans, Hispanic Americans, American Indians/Alaska Natives, Native Hawaiians and Pacific Islanders), individuals with disabilities, and/or individuals from disadvantaged backgrounds. ChicagoCHEC welcomes applications from students in all disciplines and encourages first generation college students to apply. Be a U.S. citizen or permanent resident to receive the $3600 stipend. Students that are U.S. Citizens or permanent residents are eligible to receive the stipend. Be a rising sophomore, junior, or senior, at Northeastern Illinois University, University of Illinois at Chicago, or Northwestern OR be enrolled at least half-time at one of the City Colleges of Chicago or one of the Community/Junior Colleges in the Chicago metropolitan area. Intend to apply to graduate or professional school. Community college students must intend to apply to a four year college. Post baccalaureate students can apply within two years of graduation and must intend to apply to a graduate program. Be able to attend the ChicagoCHEC Research Fellows program on a 40 hour/week, Monday through Friday, 9 AM to 5 PM basis. The program will primarily take place in downtown Chicago. Travel support to and from the program is not provided, unless otherwise specified. Individuals who are not currently enrolled, or a student-at-large at Northeastern Illinois University, University of Illinois at Chicago, Northwestern University, City Colleges of Chicago or Community/Junior Colleges in the Chicago metropolitan area are not eligible to apply. *All eligibility requirements must be in place at the time of application. The review committee will select finalists from the applicants and interview them in-person. Interviews will take place in Chicago, IL in March 2018. Applicants who are selected for interviews will receive details about the remainder of the process upon invitation. An up-to-date curriculum vitae or resume. Two separate essays on the following topics: (1) What are the reasons you want to be a ChicagoCHEC Research Fellow? Include a discussion of your strengths and qualifications for the program and how this fellowship experience will fit with your career plans (up to 300 words); and (2) What is something that people don’t necessarily know about you, but that you think they should? (up to 300 words). College transcripts (unofficial transcripts are accepted). 2. Upload all required documents to the online submission system. Letters of recommendation can be uploaded by applicants directly to the online submission system or applicants can ask faculty to email letters directly to [email protected] The final application deadline for this program is February 28, 2019 at 11:59 pm CST. ALL application materials, including letters of recommendation, must be received by this date for full consideration. Click the links below to view our informational videos about each section of the application. Applicants who become finalists will be notified in March 2019 and invited to participate in an interview. Applicants selected for the fellowship will be notified in April 2019. All applicants should familiarize themselves with online submission requirements well before the final submission deadline. In fairness to all applicants, the program will not accept late submissions. Check out our ChicagoCHEC Research Fellows Program FAQs.